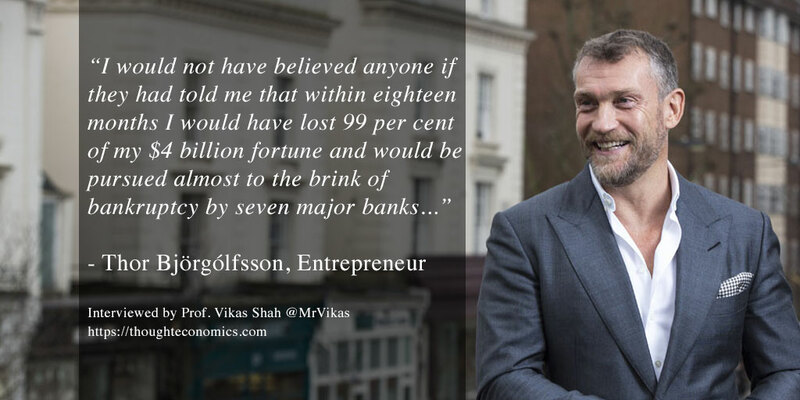 I meet Thor Bjorgolfsson, the man who made, lost and rebuilt a multi-billion dollar fortune. That one paragraph would make a fantastic synopsis for a film, but guess what… this really happened. The man who wrote this is Thor Björgólfsson, an Icelandic entrepreneur who made one of the greatest comebacks in modern entrepreneurial history- losing close to 100% of a $4 billion fortune, dusting himself off, starting again, and eventually re-joining the billionaire-class with a current fortune estimated (conservatively) at $2 billion. Thor is the founding chairman of Novator, an alternative investment firm with holdings in businesses including Actavis, CCP Games, Nova, Play, WOM and Zwift. I caught up with to learn more about going from billions to bust, and back again. Q: How did entrepreneurship come into your life? [Thor Björgólfsson] I’m from a small seafaring country where people go out and make a living as fishermen; going out and taking risks to bring home an income is part of our DNA. We live by what we catch! Iceland has a strong work ethic. I got my first job at the age of 12 running errands and delivering papers, I always had a job or two alongside being at school. In Iceland, the culture is such that you start making your way in life at a very early age. As I approached my 20’s, I realised that instead of working for a salary- it’s better to work for something where you get a percentage of the outcome, or where there’s some risk involved. Q: What is your view on risk as an entrepreneur? [Thor Björgólfsson] Are you the guy who wants to know what he gets at the end of the month? Or are you the guy who says I’ll take my chances and will do very well or very badly. If you can make that distinction in your own mind, the rest is up to you. That’s where entrepreneurship comes from; it means you can live with risk. Risk appetite is crucial for entrepreneurs. Take a look at todays’ venture capital world, people try and build in some element of risk by tying founder’s own outcomes to the performance of the company, but the bottom line is the entrepreneur needs to understand what their own perspective is. If you can’t handle the risk and you’re stressed out all the time, all you’ll do is focus on getting to the finishing line. If you can handle the risk, you are free of worry and can immerse yourself… diving headfirst into your venture. That’s where the winners come out. Q: How do you manage your stress levels in a risky and uncertain role? [Thor Björgólfsson] One or two of my friends have described my key trait as being able to function well with uncertainty on every level. Many people can find uncertainty in just one area of their lives as a problem, but for me – I thrive in that world, even when many areas of my life are uncertain. Entrepreneurs learn to switch-off to a degree, but that stress has to go somewhere. There are many times you wake-up in the middle of the night with thoughts running around, and you need to be able to manage that. I go to the gym regularly, and try to do as much socialising and motor cycle riding as I can, anything to take my mind off things. My mind is such that I can’t switch off. I’ve tried meditation, I can’t do it!. When I’m skiing as fast as I can down a mountain, I can’t be talking or thinking about anything else. When I’m on a motorcycle whizzing down the highway, I can’t talk to the guy next to me, talk on the phone or worry about work, I have to focus on the road. In these situations I get that kinda’ ‘zen like’ sense of peace and clarity. I’ve always been quite good at taking breaks regularly and doing one of these activities which puts my brain in neutral for a while before I get back into full-on life. Doctors may recommend doing this for 20 minutes a day, but I can’t do that! Every 15 days I’ll do 5 days, something like that! Q: What does wealth mean to you? [Thor Björgólfsson] Wealth is just an indicator of how well (or not) things are going. Whatever I’m doing, there are indicators… do people like what I’m doing? Do they think I’m crazy? Am I making a lot of money? These are just indicators. Wealth is not and end in itself, it’s just one of many indicator as to how you’re doing. At the peak of my wealth I enjoyed spending as much money as I could on yachts, planes, etcetera… and you know what, I couldn’t! it was almost a full-time job! When I lost it all, guess what… there wasn’t really much difference to my life. It’s all relative of course, I still had a home and we had enough to eat, but this was an important sanity check. When I lost my billionaire status wealth, I realised I didn’t miss it that much…. Q: What does failure mean to you? [Thor Björgólfsson] Having epic failures can be important, sometimes these are the events that can teach you a lot for the next stage of your career. You have to fall to get up again. We only make progress by getting up from getting kicked to the ground. How does a baby learn to walk? It falls, gets back up… falls, gets back up, and one day its running. Here’s the thing about life. You will fall, stumble and fail- that’s inevitable. You need to analyse it when it happens, learn from those mistakes, and move on. Don’t dwell on failure. Q: What do you look for in your investments? [Thor Björgólfsson] I use my intuition a lot when assessing potential investments. I will look back to my failures and successes and think about how they relate to the business we are thinking of investing in. I also like to push myself hard. We have done very well in Eastern Europe but essentially emerging markets are becoming global so we have to push ourselves into regions like Africa and South America. There are patterns that emerge. Our latest venture in Chile revealed an incredibly similar set of patterns to Poland; they are totally different countries, but with similar markets, similar demographics, a distinct lack of challengers, disruptors and foreign investments, and that’s turned out very well for us. And guess what… by copying one of our models, we managed to avoid the mistakes we made first time around. There’s no substitute for experience when you’re investing. One of the best ways to make money is not to lose it. If you can learn not to lose money, you’re making money. If you learn it by losing someone else’s money, that’s experience! When you lose your own money, it hurts, it makes you careful, but you cannot let it take the mojo… the hunger out of you. You have to be hungry and willing to go into the unknown. The unknown is where you will always find opportunity. You will never find opportunities in your comfort zone, you have to push yourself. Q: What is the role of governments in entrepreneurship? [Thor Björgólfsson] Governments often miss the point when it comes to entrepreneurship. They’re frequently too late implementing policies, or ride the crest of something that will happen anyway. In the early stages of the adoption of ideas, governments can create the platforms to turn embryonic ideas into commercial successes. The same is true of the state owned university sector; these universities play a crucial role in commercialising the intellectual property and ideas that a country is generating. Governments also need to provide tax incentives to reward people for taking risks with their own capital so that they can benefit if things go well, and have tax mechanisms to recoup losses when things don’t. Entrepreneurship, particularly in the technology and digital world, is so far ahead of legislators that policy simply cannot catch up! Q: What is your message to the next generation of entrepreneurs? [Thor Björgólfsson] Don’t be afraid to take chances, and if you fail? Get back on the horse as soon as you get thrown off… again, again and again. When I was a door to door salesman, I learned a very valuable lesson. 1 in 10 people would talk to you, 9 out of 10 would slam the door in your face. Sometimes you would get 30 doors in a row slammed in your face, but that means that there are 3 yes’ coming your way. You have to create benchmarks to aim for, stay on the positive, and ignore the nay-sayers, adversity and challenges. You have to suspend yourself from reality and focus on what you want to do. Ignore those around you who are tearing down your ideas, and focus on your mission. Thor Bjorgolfsson is a self-styled “adventure capitalist”, who became Iceland’s first billionaire. Having been ranked as the 249th-richest person in the world by Forbes magazine in 2007, his world came crashing down as the global financial crisis tore through Iceland. Thor made his first fortune in the wild east of post-Soviet Russia with Bravo Brewery, selling it to Heineken in 2002. Over the next years he multiplied his fortune by investing in telecoms (mostly in Eastern Europe), building up Actavis (a generic drugs company), and becoming the biggest investor, (along with his father) in one of Iceland’s largest banks, Landsbanki. In the financial meltdown and the collapse of Landsbanki, Thor lost 99% of his wealth; in 2010 he appeared on the front-page of Iceland’s biggest newspaper apologising for his role in the crisis. Facing crippling debts, he settled with his creditors and slowly re-built his business empire. By 2014, through the various investments of his London-based private equity fund Novator Partners LLP, Thor had become a billionaire again. Thor continues to be an active investor in the emerging economies of Central and Eastern Europe and Latin America, with particular interest in telecommunications companies. He is Chairman of Novator, sits on several boards, and maintains a shareholding in companies including Actavis, Play a Polish telecoms firm, and CCP an Icelandic computer games company. Thor’s autobiography, “Billions to Bust—and Back: How I Made, Lost and Rebuilt a Fortune, And What I Learned on the Way”, was published in 2014.